Global Pulp & Paper Enzymes Market size was worth over USD 125 million in 2016 and will surpass 9,500 tons by 2024. 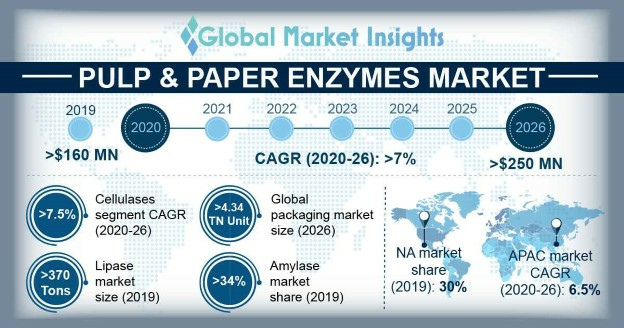 Rapid expansion in paper packaging industry due to rising demand for sustainable packing solutions from FMCG, healthcare, pharmaceutical and food processing sector is expected to drive pulp & paper enzymes market. Lightweight, durable, convenient and tamper proofing are among the key properties fuelling product demand. As per analysis, the global packaging industry is expected to exceed USD 1 trillion by 2021, growing at an annual rate of 3.5%. Paper packaging accounted for over 36% of the overall industry share in 2016. Growth in e-commerce sector due to convenience in shopping will positively influence flexible packaging market growth. In 2016, Amazon’s annual sales were over USD 136 billion, with carboard packaging being the highly preferred material. Recyclability along with strong & versatile appearance has facilitate industry growth. High adoption of auxiliary chemicals to enhance fibre modification, bleaching & deinking will support the pulp & paper enzymes market. Reduced energy consumption and improved quality are the key supporting properties enhancing product penetration. Shifting manufacturer’s focus towards reducing production cost to maximize profit and use biological materials including hemicellulose, cellulose and lignin for more beneficial effectiveness will fuel the industry growth. Increasing environmental concerns owing to high plastic bags usage is expected to fuel pulp & paper enzymes market. Global annual plastic bags consumption was over 1 trillion in 2016, causing life threat to marine animal’s due to plastic disposals in water bodies will encourage paper packaging demand. For instance, globally around 100,000 marine animals die every year due to consuming plastic. Further, strong government support and deterring environmental taxes mainly in Europe and the U.S. are the key factors driving the product demand. Growth in printing industry has opened new avenues for the pulp & paper enzymes market size. Rising necessity for advertisement including billboards in cities coupled with increasing printing on packaging to enhance visual appeal will provide positive outlook to the industry growth. Increasing demand for notebooks particularly in schools & colleges due to various government initiatives will propel the pulp & paper enzymes demand. High product cost compared to traditional chemicals along with emergence of digital media causing reduced cardboard usage are the major challenges for pulp & paper enzymes market. Moreover, stringent government regulations in Europe for pulp & paper mills, resulting in closure of many inefficient manufacturing facilities may hamper the industry potential. This may result in intense price based competition within the industry. Amylase paper & pulp enzymes market was valued over USD 45 million in 2016. The product demand in this segment will be driven by its widescale usage in various applications including, deinking, coating of starch, cleaning and drainage improvement particularly in cardboard industry. In addition, increasing demand for smooth sheets to ease the printing will support the product scope. Cellulase market is estimated to register over 3.5 kilo tons by 2024. Increased usage of cellulose for fiber modification, improving machine run ability, reducing risk of unwanted deposits and drain refining recycled waste cardboard is expected to fuel the product demand. Reduced use of harsh chemicals including, caustic soda owing to emergence of cellulose will support product demand. Lipase will witness gains at 6% up to 2024. Effectiveness in improving pitch problems associated with sulfite pulps is projected to drive this segment’s growth. It is also used in treating unbleached sulfite for removing most of triglycerides. Xylanases will be worth over USD 35 million by 2024. Reduction in amount of chemical required for bleaching of kraft pulps to attain a specified brightness will provide lucrative opportunities for xylanases demand. APAC pulp & paper enzymes market was valued over USD 50 million in 2016. Favourable socio-economic conditions particularly in Japan, India, China and South Korea has enhanced the industry demand. As per analysis, the paper consumption in India will rise from 13 million tons in 2014 to around 20 million tons by 2020. Growing environmental concern in the region will propel the industry demand as these enzymes help in reducing biological oxygen demand of waste water, thereby reducing environmental damage caused by the release of heavy amount of waste water. North America pulp & paper enzymes market will witness over 5.5% growth up to 2024. Presence of large scale industries accompanied by growth of packaging industry will drive the demand. Increasing product innovation and research & development spending by several firms will support product scope. Strong economic background, improved transportation service for delivery of finished products are the key factors for the regional demand. Europe pulp & paper enzymes market accounted for more than 18% of the overall industry share in 2016. Technological advancement and innovations has enhanced wood fibers in superior quality cardboard production. Increasing adoption of the bio based products will open new avenues for the business growth in this region. 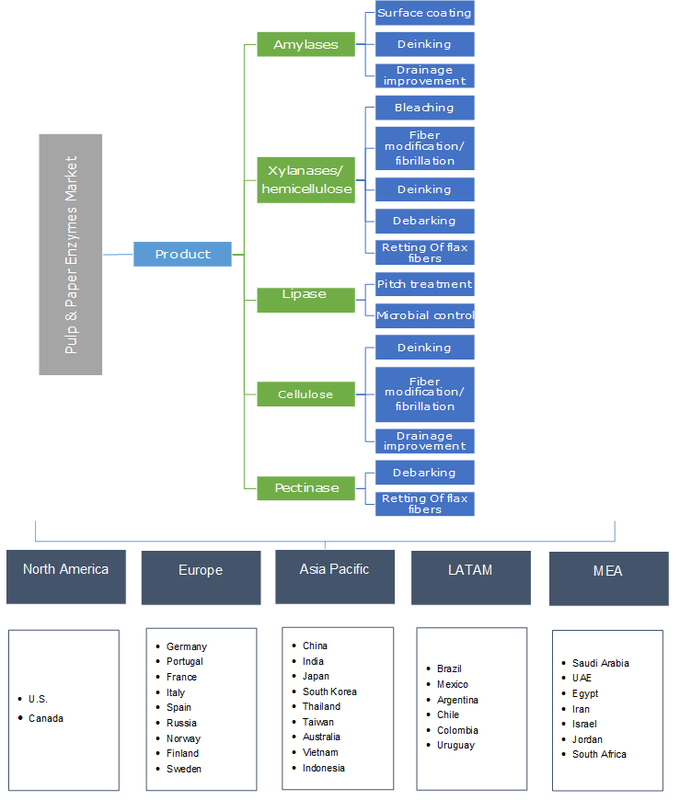 Global industry share is highly consolidated with the presence of top three players including, Novozymes, Dupont and AB Enzymes capturing around 60% of the overall industry share. Besides, Buckman Laboratories and Enzymatic Deinking Technologies accounts for 20% of the market share. Biotech, Anthem Cellutions, Rossari Biotech, MetGen, Nature Bioscience, Krishna Speciality Chemicals, KPS Bio, Enzyme Solutions and Iogen Corporation are the other prominent industry players. Mergers & acquisitions, production capacity expansion, joint venture along with product portfolio expansion and agreements are the key strategies adopted. For instance, in January 2013, Novozymes acquired industrial enzyme business of Iogen Corporation of worth USD 53.8 million. The acquisition had a positive impact on Novozymes sales growth. The major companies are supplying formulations directly to the formulators rather than dealing directly with industry, with Novozymes being an exception. Pulp & paper enzymes are used for bleaching, biomechanical pounding, deinking, microbial control and catalase for peroxide removal. Emergence of new enzyme in the industry will propel industry growth making it more lucrative in the coming years. The product is beneficial in improving productivity & product quality and limiting the environmental impact. Research & development activity for pulp & paper enzymes market is at a nascent stage. For instance, there is no R&D identified for the pulp & paper enzymes market in Estonia, despite being the presence of top three industry leaders in the region. The region is full of lush green forests, accounting for around 53.9% of the total land area, thus providing an opportunity for the industry to bloom. Expansion in supply chain dynamics coupled with advancing technologies for product manufacturing will positively impact the industry demand. Earlier, enzyme is produced from animal organs, but with advancement in technology, companies now have the choice of producing it from transgenic plants and microorganisms. Cost of the enzyme has gone down considerably, with the advent of new manufacturing techniques such as genetic and protein engineering for large scale production. Besides, suppliers focus more on production of specific enzymes from genetically modified microorganisms to manufacture enzyme having specific characteristics.